Banja Luka (Serbian Cyrillic: Бања Лука; pronounced [bǎɲa lǔːka]) or Banjaluka (Serbian Cyrillic: Бањалука) is the second largest city in Bosnia and Herzegovina and the de facto capital of its Republika Srpska entity. It is the traditional centre of the densely-forested Bosanska Krajina region located in northwestern Bosnia. According to the 2013 census[update], the city proper has a population of 138,963, while its administrative area comprises a total of 180,053 inhabitants. 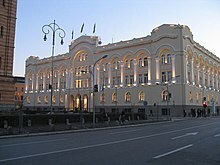 The city is home to the University of Banja Luka as well as numerous state and entity institutions of Bosnia and Herzegovina. The city lies on the Vrbas River and is well known in the countries of the former Yugoslavia for being full of tree-lined avenues, boulevards, gardens, and parks. The name 'Banja Luka' was first mentioned in a document dated to 6 February 1494 by Ladislaus II of Hungary. The name is interpreted as the 'Ban's meadow', from the words ban (a mediaeval noble title), and luka ('valley' or 'meadow'). The identity of the ban and the meadow in question remain uncertain, and popular etymology combines the modern words banja ('bath' or 'spa'), or bajna ('marvelous') and luka ('port'). A different interpretation is suggested by the Hungarian name Lukácsbánya, in English 'Luke's Mine', which is also the meaning of the Slovak baňa Luka. In modern usage, the name is pronounced and usually declined (u Banjaluci) as one word, and often written as such. The citizens reportedly prefer the form with inflected adjective (u Banjoj Luci). Banja Luka covers some 96.2 km2 (37.1 sq mi) of land in Bosnia and Herzegovina and is situated on either bank of the Vrbas in the Banja Luka valley, which is characteristically flat within the otherwise hilly region. Banja Luka's centre lies 163 m (534.78 ft) above sea level. The source of the Vrbas River is about 90 km (56 mi) to the south at the Vranica mountain. Its tributaries—the Suturlija, the Crkvena, and the Vrbanja—flow into the Vrbas at various points in the city. A number of springs can be found nearby. The area around Banja Luka is mostly woodland, although there are mountains a little further from the city. The most notable of these mountains are Manjača (1,214 m), Čemernica (1,338 m), and Tisovac. These are all part of the Dinaric Alps mountain range. Banja Luka has a moderate humid subtropical climate with mild winters, frequent frosts, and warm summers. The warmest month of the year is July, with an average temperature of 22.8 °C (73.0 °F). The coldest month of the year is January, when temperatures average around 1.7 °C (35.1 °F). The annual precipitation for the city is about 1,037.2 millimetres (41 inches). Banja Luka has an average of 104 rainy days a year. Due to the city's relatively high latitude and inland location, it snows in Banja Luka almost every year. Strong winds come from the north and northeast. Sometimes, southern winds which bring hot weather are also prevalent. The Krupa River, is the left tributary of the Vrbas and protected area, just few kilometers upstream from the city. Slavs settled in the Balkans in the 6th century. mediaeval fortresses in the vicinity of Banja Luka include Vrbas (1224), župa Zemljanik (1287), Kotor Varoš (1323), Zvečaj (1404), and Bočac (1446). The name "Banja Luka" was first mentioned in a document dated 6 February 1494, by Vladislav II. Banja Luka fell to the Ottomans in 1527. It became the seat of the Sanjak of Bosnia some time prior to 1554, until 1580 when the Bosnia Eyalet was established. Bosnian beylerbeys were seated in Banja Luka until 1639. Ferhad Pasha Sokolović, a relative of Grand Vizier Mehmed-pasha Sokolović, had upon his return to Bosnia in 1574, begun the building of over 200 buildings ranging from artisan and sales shops to wheat warehouses, baths and mosques. Among more important commissions were the Ferhadija and Arnaudija mosques during which construction a plumbing infrastructure was laid that served surrounding residential areas. This stimulated the economic and urban development of Banja Luka, which soon became one of the leading commercial and political centres in Bosnia. It was also sanjak centre in Bosna Eyalet. In 1688, the city was burned down by the Austrian army, but it quickly recovered. Later periodic intrusions by the Austrian army stimulated military developments in Banja Luka, which made it into a strategic military centre. Orthodox churches and monasteries near Banja Luka were built in the 19th century. Also, Sephardic Jews and Trappists migrated to the city in the 19th century and contributed to the early industrialisation of the region by building mills, breweries, brick factories, textile factories and other important structures. 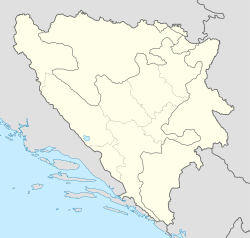 During World War II, Banja Luka was part of the Independent State of Croatia. Most of Banja Luka's Serbs and Jews were deported to concentration camps such as Jasenovac and Stara Gradiška. On 7 February 1942, Ustaše paramilitaries, led by a Franciscan friar, Miroslav Filipović (aka Tomislav Filipović-Majstorović), killed more than 2,300 Serbs (among them 500 children) in Drakulić, Motike and Šargovac (a part of the Banja Luka municipality). On 26 and 27 October 1969, two devastating earthquakes (6.0 and 6.4 on the Richter scale) damaged many buildings in Banja Luka. Around 20 to 23 people were killed, and over a thousand injured. A large building called Titanik in the centre of the town was razed to the ground, and the area was later turned into a central public square. With contributions from all over Yugoslavia, Banja Luka was repaired and rebuilt. That was a period when a large Serb population moved to the city from the surrounding villages, and from more distant areas in Herzegovina. The 1579's Ferhat Pasha Mosque was blown-up by explosives in 1993. Following meticulous reconstruction it was reopened in 2016. Nearly all of Banja Luka's Croats and Bosniaks were expelled during the war and all of the city's 16 mosques including the Ferhat Pasha Mosque were stacked with explosives and destroyed. A court ruling resulted in the authorities of Banja Luka having to pay $42 million for the destruction of the mosques. Later, an estimated 40,000 Serbs from Croat- and Bosniak-dominated areas of Bosnia, having been exiled from their homes, settled in Banja Luka. However, the Banja Luka district court later overturned the ruling stating that the claims had exceeded a three-year statute of limitations. The Bosniak community vowed to appeal against the decision. On 7 May 2001, several thousand Serb nationalists attacked a group of Bosniaks and members of the diplomatic corps attending a ceremony of marking the reconstruction of the historic 16th-century Ferhadija mosque. There were indications of police collaboration. More than 30 individuals were injured during the attack, and on 26 May, Murat Badić, who had been in a coma after the attack, died from head injuries. Fourteen Bosnian Serb nationalists were jailed for starting the riots. Banja Luka plays an important role on different levels of Bosnia and Herzegovina's government structures. Banja Luka is the centre of the government for the Municipality of Banja Luka. A number of entity and state institutions are seated in the city. The Republika Srpska Government and the National Assembly are based in Banja Luka. The Bosnia and Herzegovina State Agencies based in the city include the Indirect Taxation (VAT) Authority, the Deposit Insurance Agency as well as a branch of the Central Bank of Bosnia and Herzegovina (formerly the National Bank of Republika Srpska). Austria, Croatia, France, Germany, Serbia, the United Kingdom and the United States maintain diplomatic representation through consulates-general in Banja Luka. Although the city itself was not directly affected by the Bosnian war in the early 1990s, its economy was. In this period Banja Luka fell behind the world in key areas such as technology, resulting in a rather stagnant economy. However, in recent years, the financial services sector has gained in importance in the city. In 2002, the trading began on the newly established Banja Luka Stock Exchange. The number of companies listed, the trading volume and the number of investors have increased significantly. A number of big companies such as Telekom Srpske, Rafinerija ulja Modriča, Banjalučka Pivara and Vitaminka are all listed on the exchange and are traded regularly. Investors, apart from those from Slovenia, Croatia and Serbia, now include a number of investment funds from the EU, and from Norway, the United States, Japan and China. A number of financial services regulators, such as the Republika Srpska Securities Commission and the RS Banking Agency are headquartered in Banja Luka. This, along with the fact that some of the major banks in Bosnia, the Deposit Insurance Agency and the value-added tax (VAT) authority are all based in the city, has helped Banja Luka establish itself as a major financial centre of the country. The Museum of Republika Srpska inherited the Ethnographic Museum established in 1930, and broadened its setting with collections of archeology, history, art history and nature. The Museum of Modern Art of Republika Srpska, also called MSURS, the Museum of Contemporary Art, displays exhibitions of both domestic and worldwide artists. Banja Luka is home to the National Theatre and National Library, both dating from the first half of the 20th century, and of numerous other theatres. The headquarters of the Archives of Republika Srpska is situated in the building known as Carska kuća or Imperial House, built around 1880. It has been in continuous public use longer than any other structure in Banja Luka. One of the most famous cultural sites in Banja Luka is the cultural centre of "Banski Dvor" (Halls of the Ban), built in the 1930s as the residence for the Bans of the Vrbas Banovina. In the city there are many Cultural Artistic Associations. The oldest is CAA "Pelagić" (founded 1927), one of the oldest institutions of this kind in Bosnia and Herzegovina. In 2009 Banja Luka was host of World Cup in rafting. The city has a long tradition of handball. RK Borac Banjaluka was the European Champion in 1976, the European Vice-Champion in 1975 and the winner of the IHF Cup in 1991. Recently, tennis has taken on a bigger role in the city. The local tennis tournament, "Memorijal Trive Vujića", has become professional and has been awarded ATP status in 2001, with the rank of a Challenger. The Banja Luka Challenger takes place in September each year. In 2005, the European Championships in Rafting were held on the Vrbas river. In 2006, the Davis Cup matches of the Europe/Africa Zone Group III took place in the city. Since 2015, the city hosts the Banjaluka Half-marathon. Public transportation within Banja Luka is exclusively operated by the bus services. Over thirty bus lines connect downtown with the rest of the city and its suburbs. The oldest bus link in the city is line No 1. Taxis are also readily available. The expressway E-661 (locally known as M-16) leads north to Croatia from Banja Luka by way of Gradiška, near the Bosnian/Croatian border. A wide range of bus services are available to most neighbouring and larger towns in Bosnia and Herzegovina, as well as to regional and European destinations such as Austria, Belgium, Croatia, Germany, France, Italy, Montenegro, The Netherlands, Serbia, Sweden, Switzerland and Slovakia. Banja Luka is the hub of the railway services of Željeznice Republike Srpske, comprising one half of the railway network of Bosnia and Herzegovina. Services operate to most northern Bosnian towns, and two modern air-conditioned 'Talgo' trains run to Sarajevo every day. However, services are relatively slow and infrequent compared with neighbouring countries. Banja Luka International Airport (IATA: BNX, ICAO: LQBK) is located 23 km (14 mi) north of Banja Luka. The airport is served by Air Serbia, which operates flights to Belgrade and summer charters to Antalya, while Ryanair operates flight to Brussels, Memmingen and Stockholm. There is also Banja Luka Zalužani Airfield, a small airstrip. ^ "АСБЛ >> General information". www.banjaluka.rs.ba. ^ "Klimatafel von Banja Luka/Bosnien und Herzegowina" (PDF). Baseline climate means (1961-1990) from stations all over the world (in German). Deutscher Wetterdienst. Retrieved 22 November 2016. ^ "Station 14542 Banja Luka". Global station data 1961–1990—Sunshine Duration. Deutscher Wetterdienst. Retrieved 29 January 2016. ^ "Ad Ladios: a Pleiades place resource". Pleiades: a gazetteer of past places. ^ Društvo istoričara Bosne i Hercegovine (1952). Godišnjak: Annuaire. Бања Лука је постала сједиште босанског санџака нешто прије 1554 и остала то све до 1580 када је основан босански пашалук. У Бањој Луци су столовали и босански беглербези све до године 1639. ^ Kolovos, Elias (2007). The Ottoman Empire, the Balkans, the Greek lands: toward a social and economic history: studies in honor of John C. Alexander. Isis Press. p. 192. ISBN 975-428-346-X. ISBN 9789754283464. ^ Jovan Cvijić, Balkansko poluostrvo i južnoslovenske zemlje /Balkan Peninsula and South Slav Countries/ (Belgrade: Zavod za izdavanje udžbenika, 1966), pp. 151-152. ^ Svestenomucenik Platon, spc.org.yu; accessed 14 December 2015. ^ NOAA National Geographical Data Center, Significant Earthquake Database states that the 15:36 26 October 1969 earthquake was 6.0 magnitude (intensity 8 Mercalli scale) and killed 14 people and causing $50 million damage, whilst the 08:10 27 October 1969 earthquake was 6.4 magnitude (intensity 9 Mercalli scale) and killed 9 people. The earthquake location was 44.9 Lat 17.3 Long on 26 October, and 44.9 Lat 17.2 Long on 27 October. Both had a focal depth of 33. Gymnasium Banja Luka History Archived 6 July 2011 at the Wayback Machine claims that the 26 October 1969 earthquake had an intensity of 7.5 on the Mercalli intensity scale, whilst the 27 October 1969 earthquake had an intensity of 8.5 on the Mercalli scale. ^ a b "Serbs ordered to pay for mosques". BBC News. 20 February 2009. Retrieved 30 March 2010. ^ "Neriješena ubistva banjalučkih Hrvata". Orbus. 3 April 2007. Retrieved 13 March 2016. ^ Perlez, Jane (7 August 1995). "CONFLICT IN THE BALKANS: THE SERBIAN REFUGEES; Serbs Become Latest Victims In Changing Fortunes of War". The New York Times. Retrieved 30 March 2010. ^ Mackic, Erna (13 November 2009). "Historic Decisions by Banja Luka Court". Balkan Investigative Reporting Network. Archived from the original on 20 February 2010. ^ Saric, Velma (13 November 2009). "Bosnian Muslims Appeal Mosque Ruling". Institute for War & Peace Reporting. ^ Strauss, Julius (8 May 2001). "Serb mob attacks Muslims". The Daily Telegraph. London, UK. Retrieved 30 March 2010. ^ "UN condemns Serb 'sickness'". BBC. 8 May 2001. ^ "Bosnian Serb Crowd Beats Muslims at Mosque Rebuilding". The New York Times. 8 May 2001. Retrieved 30 March 2010. ^ "Helsinki Commission releases U.S. statement on tolerance and non-discrimination at osce human dimension implementation meeting". Helsinki Commission. 20 September 2001. Archived from the original on 11 May 2015. ^ "Bosnians jailed over mosque riots". BBC News. 21 October 2002. Retrieved 30 March 2010. ^ "Popis 2013" (PDF) (in Bosnian, Croatian, and Serbian). Retrieved 22 July 2016. ^ United Nations High Commissioner for Refugees. "War Crimes in Bosnia-Hercegovina: U.N. Cease-Fire Won't Help Banja Luka". UNHCR. Archived from the original on 14 October 2012. Retrieved 26 March 2013. ^ "OSCE Regional Centre Banja Luka: Fact Sheet" (PDF). Archived from the original (PDF) on 14 October 2006. ^ "nacion po mjesnim.xls" (PDF). Archived from the original (PDF) on 5 October 2013. Retrieved 26 March 2013. ^ "RKUD "Pelagić", Banja Luka". Rkud-pelagic.org. 13 August 2012. Retrieved 26 March 2013. ^ a b c d e f g h i j k l m Градови партнери [City of Banja Luka - Partner cities]. Administrative Office of the City of Banja Luka (in Serbian). Archived from the original on 17 September 2011. Retrieved 9 August 2013.